There are many paths that you can take to Alaska on Spring Adventure Package and this is just one example. We encourage you to research different routes to Alaska based upon your time, budget, and sightseeing agenda. You arrive in Forest City, Iowa and settle in for the evening and prepare for the start of your Passport to Adventure. After your video orientation in the morning, you consult your map one last time, fire up your engine and head off to Alaska. You choose the road from Iowa or Indiana through South Dakota and see the sculpted majesty of the Badlands (2) and the amazing Wind Caves. Your camera never stops snapping as Mt. Rushmore (3) and Crazy Horse Monuments captivate you with their grandeur. In Wyoming you stare skyward at the Devil’s Tower (4) and further west the Grand Tetons display their mighty rise from the valley floor. Further on at Yellowstone (5), the buffalo meander slowly grazing on spring grasses. Venturing into Montana reveals the history of Custer’s Battlefield while the towns of Billings, and the state capitol of Helena, provide welcome places to rest and restock your supplies. As you roll north to the border, Glacier National Park (6) is a true wonder but there is even more fun in Calgary, Canada, the home of the world famous Calgary Stampede. A side trip west to the Banff Hotel (7) and Lake Louise is always worth the view. Pushing ever northward, Edmonton is the last sizable city before crossing over the Alberta-British Columbia border to Dawson Creek and the beginning of the Alcan Highway. The Alcan was built in 1942 by the U.S. Army Corps of Engineers. They created 1,523 miles of road through the wilderness in only 9 months, despite mud and muskeg in the summer and ice and snow in the winter. Further along it is time for a warm dip in the Liard Hot Springs (8). At Watson Lake you visit the famous “Sign Forest” (9) where you nail up that old sign borrowed from the kids room. Then it’s on to Whitehorse and a visit to gold rush history in the riverboat SS Klondike (10). Just when you believe nothing could be more beautiful than Canada, you arrive in Alaska where the scenery takes your breath away. As you drive, the Wrangell Mountains, glaciers, and wildlife greet you. You pay a visit to Delta Junction (11) and the end of the famous Alcan Highway. All too soon you arrive at Great Alaskan Holidays in Anchorage (12) with memories of a lifetime. Opt-in to our email list for the latest news and information on our Spring Adventure Package, including future SAP availability. The above description is only a suggested route. It is approximately 3,860 miles and takes about a week to drive enjoyably (not including side trips). We suggest taking your time and making lots of stops for the most fun. 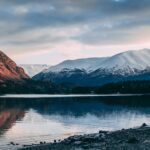 Our Spring Adventure vacationers take many different routes to Alaska based upon their time, budget, and sightseeing agenda. 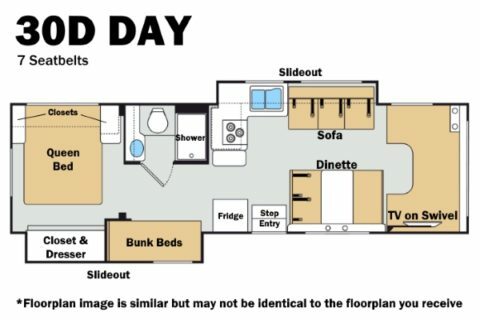 The complete vacation consists of driving from Forest City, Iowa to Anchorage, Alaska in a brand new motorhome. Sold out every year for the last 21 years, the earlier you reserve this incredible trip, the better your chance of availability and of getting the motorhome floor plan you desire*. 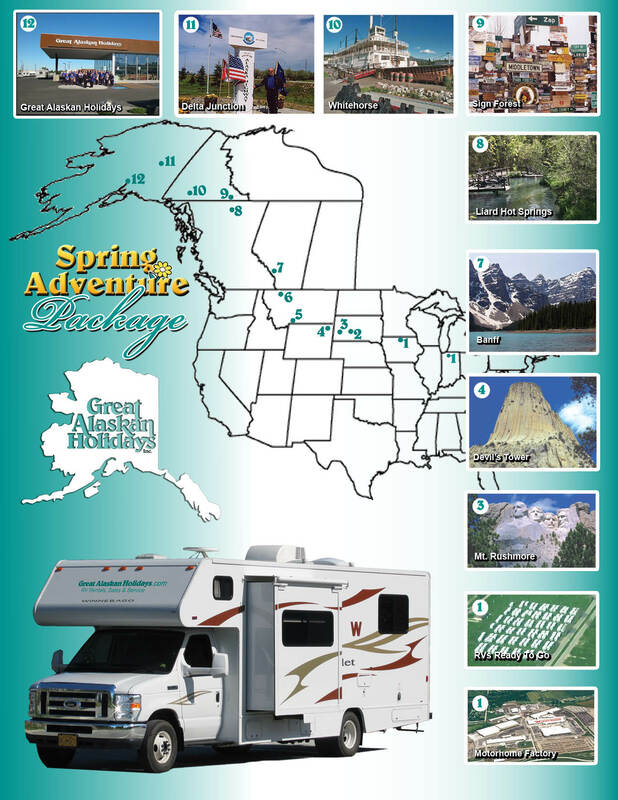 *The Spring Adventure Package motorhome vacation is ONLY available to United States citizens. Once your reservation is placed, click here to download, print, and fill out the appropriate forms and return to them us within 48 hours. The forms can be emailed to reservations@rvak.com or faxed to our office at 907-248-7878. Reservation confirmations will be processed as we receive them. *Please read all of the following information titled Spring Adventure Package Rates & Conditions before completing either the Spring Package Reservation Request form, Optional Rental Items Request form, or the Charter Bus Transfer Reservation Request form. SAP prices above do not include taxes, fees, additional days, additional mileage, or optional rental items. 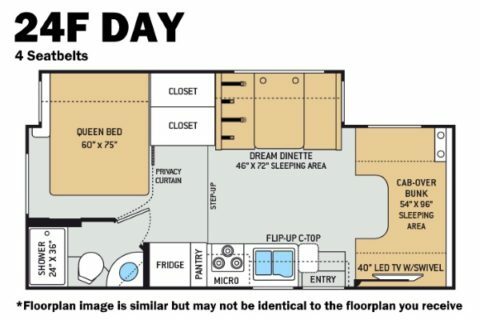 *Floorplans or designation numbers may have changed from 2018 and previous rental seasons. Price does not include taxes, fees, additional days, additional mileage, or optional rental items. If you wish to take advantage of the bus service please read and complete the optional Charter Bus Transfer Reservation Request Form. Please do not fill out and send this form until your Reservation Request Form has been confirmed. You can add up to 7 additional days at the special promotional rate of $59.95 per day, any size! Even more additional days may be added, beyond the 18-day Spring Adventure Package, at the published pay per mile rate*. (Call a reservation consultant at 1-888-2-ALASKA to obtain the daily promotional and mileage rates for these additional days). This is an extremely popular trip and usually sells out very quickly. Don’t delay making your reservation. You may miss the best vacation ever. If you can’t make it this year, let us know if you would like to be on the mailing list for next year. **Additional miles over the allotted amount are 20 cents per mile up to 2,000 additional miles (3,900 + 2,000) and 39 cents per mile thereafter. Most Spring Adventure vacationers drive an average of 4,600 miles with the minimum direct route being a 3,660 mile trip. Some have driven up to 6,138 miles over 21 days. Less than 2% of vacationers will pay the 39 cents per mile rate. Call 1-888-2-ALASKA for rate details. There are no refunds for unused days or unused free miles. The above rates do not include tax. All drivers must be 25 years of age or older, and have a current and valid driver’s license from their state of residence. Authorized drivers may be asked to sign a driving record addendum or be subject to a computerized Department of Motor Vehicles check. A valid, signed Visa, MasterCard or Discover credit card (not a check/debit card) must be presented at time of pick up. Non-refundable Reservation Deposit of $500. 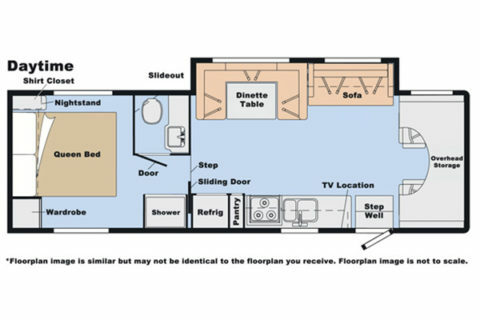 When you pick up the motorhome, the entire Reservation Deposit becomes a Damage Deposit. Upon return of the motorhome, the actual rental charges will be established and your Damage Deposit refund will be mailed within three business days. More than 90 days before your pick up date we will send you a Rental Agreement to complete. Daily Rental fees and the completed Rental Agreement must be received in our office 75 days before pick up date. The $500 Reservation Deposit can be paid by Visa, MasterCard, Discover card or check. We do not accept prepayment of the Daily Rental Fees by credit card. These fees must be paid by personal check or cashier’s check. Pick up/Orientation time is between 8:00 a.m. and noon p.m., and will be scheduled at the time you make your reservation on a first-come, first-served basis. Your scheduled pick up time will be your scheduled return time. For example if your scheduled pick up time is 10:35 a.m. the motorhome return time is 10:35 a.m. on your return day. 140-watt inverter can be rented for $1.50 per rental day, a 300-watt inverter is available for $3.50 per rental day, a toaster is available for $7.50 per toaster, a Deluxe BBQ is available for $34.95 per BBQ, and lawn chairs are available at $12.00 per chair. We are sorry, but due to shipping constraints, at this time we are not able to include the ice chest. Clients and all members of their party must possess adequate identification and have the ability to enter and transit Canada. Visit the U.S. Department of State website at http://travel.state.gov/ for the latest information on passport requirements. To provide you the most affordable transportation we could arrange Great Alaskan Holidays is offering a charter bus transfer between Minneapolis/St. Paul Airport and Forest City, Iowa for $34.95 per person. If you wish to take advantage of the bus service please read and complete the optional Charter Bus Transfer Reservation Request Form. Transfer reservations are on a first-come, first-served basis and must be scheduled for the day before your pick up. Transfers include access and overnight stay in your motorhome at no additional charge. Overnight access is only available without additional charge for customers using the Charter Bus Transfer. 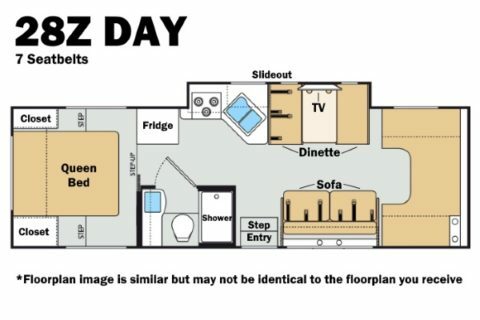 Other customers wishing to occupy their motorhome the night before their scheduled pick up day may do so for a $75.00 fee. Call us toll free at 1‑888-2-ALASKA (1-888-225-2752) and we will check availability for the Spring Adventure Package. Once you call us and confirm there is availability, please complete the Spring Adventure Reservation Request form and drop it in the mail with your $500 reservation deposit or, if you are paying the deposit by Visa, MasterCard, or Discover card, you may fax the form to (907) 248-7878. It’s that easy! Upon receipt of your Optional Rental Items Request Form, Reservation Request Form and $500 deposit, we will send you written tentative confirmation of your reservation. For Spring Adventure Package reservations made prior to the first week of January, confirmation of your reservation, including confirmation of the size of your motorhome will be made the first week of January. If your Spring Adventure Reservation Request is received after the first week of January, then confirmation will be mailed within 7 days of receipt. Size requests will be honored in the order in which the reservations are received. When we confirm your reservation, we will send you a complimentary copy of The Milepost so you can get started planning your adventure. The Milepost will offer you great trip planning suggestions including possible side trips, “must see” sights, and advice on road conditions. WE HAVE STILL HAVE 2017 PACKAGES AVAILABLE!! Call 907-248-7777 To Reserve this package. First come, First serve for 2017 SAP list members.